Like the Sportage crossover? Then you will love the KX-4. 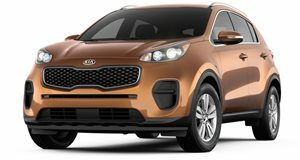 Kia has just released the latest, greatest Sportage to make its way off the South Korean manufacturer&apos;s production line. The 2012 Sportage KX-4 is set to top their range both in terms of power and luxury. Starting under the crossover&apos;s hood, the KX-4 features a 47hp boost over its predecessor&apos;s 134hp engine. That means the 2.0 CRDi diesel plant now produces 181hp sent to all four wheels. A standard six-speed manual transmission returns a fuel economy rating of 46.3mpg and CO2 emissions of 158g/km. A less efficient six-speed automatic gearbox is optional and returns 39.2mpg while emitting only 189g/km CO2. All told, the added power is good for a 0-60mph time of 9.4 seconds and a top speed of 120mph (with the automatic transmission, 121mph). What the Sportage KX-4 lacks in speed it more than makes up for in luxury. The interior features leather upholstery as standard along with sat-nav, heated seats, automatic windshield wipers and lights, panoramic sunroof, climate control, upgraded sound system, reversing camera and more. It rides on a set of 18-inch alloy wheels. The 2012 Kia Sportage KX-4 prices at £27,195 with the efficient manual transmission while the automatic gearbox carries a £28,500 price tag.